So, who’s posting news in each language? We’ve not had a working French language campaigns newswire for weeks (maybe months). Now fixed – see it here. Thanks for everyone’s patience with this. We’ve shown the ad ‘Facebook is for scabs’ 1,416,224 times in the last week at a cost to us of $379.61. 446 people have clicked through to visit UnionBook as a result. In the last 10 days, 254 people have signed up to join UnionBook, which now has 1,614 members. (At the current rate, we’ll reach 2,000 members in another two weeks.) I intend to continue running the ad for a few more days at least. 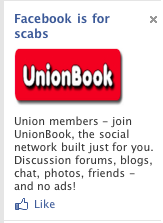 The ad campaign on Facebook has given UnionBook the kind of exposure you can only pay for … and we are paying for it. In the last day and a half or so, since our ads went live, they’ve been shown over 300,000 times. A small number of people have clicked through (87 so far) and we only pay for those. One result of all this is that we’ve seen a significant increase in the number of new users of UnionBook. We now have over 1,500 users of the site, 127 of whom joined in the last day and a half. Today we switched the domain name so that http://www.unionbook.org points to the new site. The old site can be found at http://www.unionbook.org.uk — but this is causing problems and people cannot access the old site. We’ll try to have that fixed by the weekend. We’re getting ready to shut down the old UnionBook and replace it with the new one. In anticipation of this, I ran a survey — and will publish full results later this week. But the headline is this: 427 people have responded so far. An overwhelming majority – 83% – want to continue with the new, Ning-based version of UnionBook. Only 7% would want to go back to the old, Elgg-based version. I’ve just set up an online form here that allows us to easily translate our news interface into new languages. I’ll be testing it out today with the trade unions in Georgia. If this works, I’ll do the same for our campaigns. My weekly podcast this week is about ‘software design and proletarian internationalism’ and is all about our experience using Ning. Listen to it here.